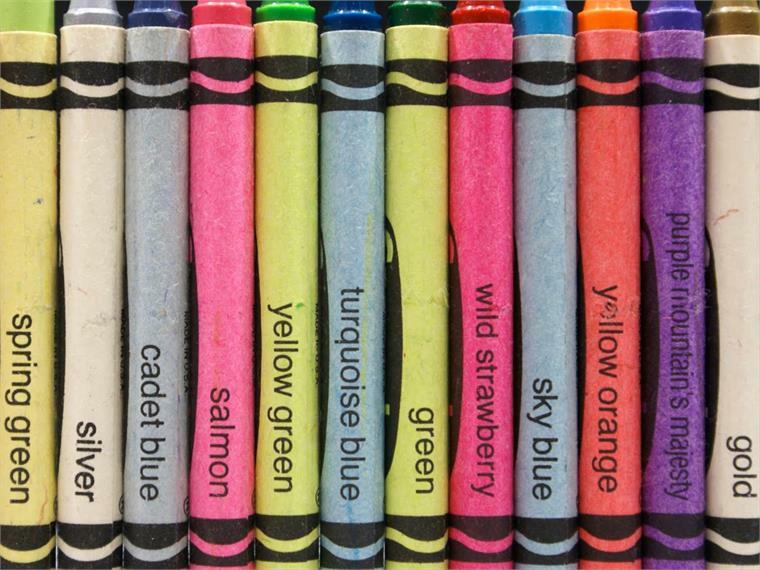 Crayola’s 133-colour standard palette has moved into the digital world as each colour is assigned its own hex value. 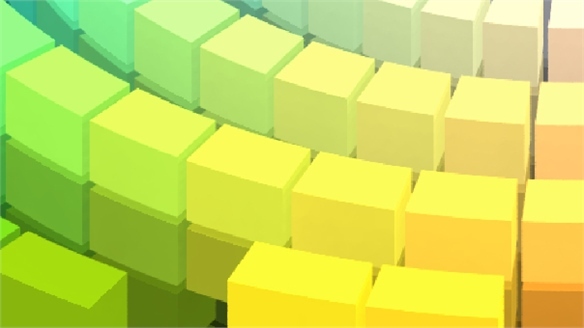 Used to code colour in web design, the six-digit hex values act as Pantone codes for the digital world. 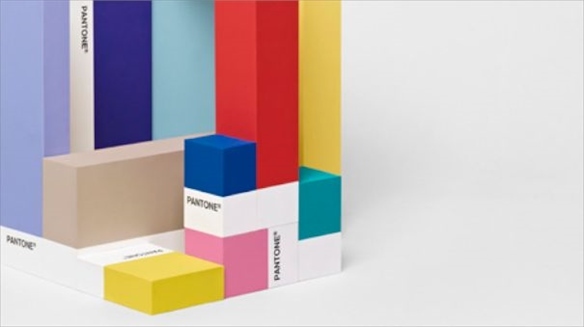 The complete list was transcribed from Crayola’s Custom Box Creator – an area of its webstore that allows visitors to order a unique four-colour palette selected from the complete range. For a full list of values, visit the brand’s Wikipedia entry. 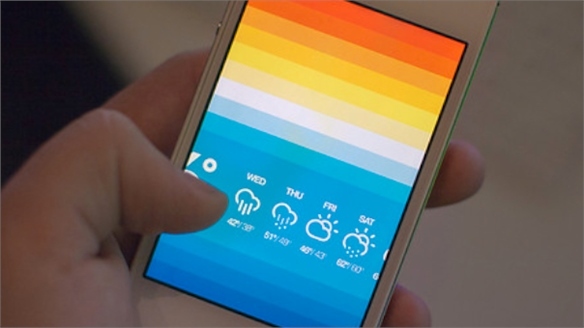 Weather Forecast by Hue Weather Forecast by Hue Brisk, an app designed by digital studio TwoSolid, uses graduated blocks of colour to visually describe the weather in a given location. 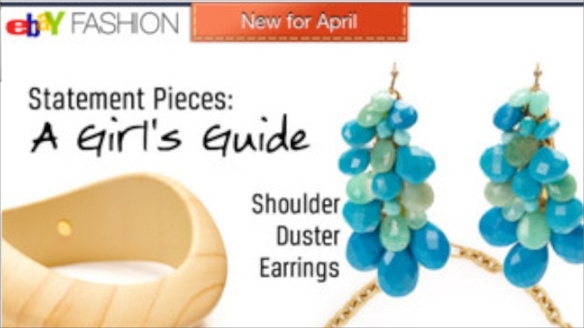 Ebay Colour & Pattern Matching App Ebay Colour App Online e-tailer eBay has launched a colour and pattern-matching app, helping shoppers to find items that match images of colours and patterns that they upload via the app. 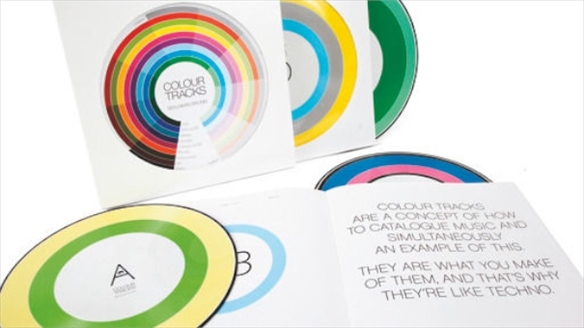 Colour Tracks Colour Tracks Electronic music producer Benjamin Brunn has released Colour Tracks, a four-record box set that uses colour as an indicator for the genre of music on each vinyl record. 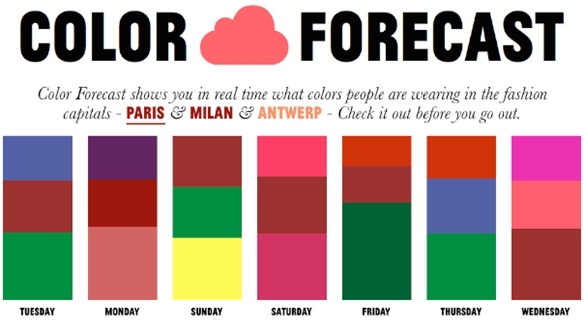 Pimkie Realtime Colour Tracker Pimkie Colour Tracker French fashion brand Pimkie has launched a real-time colour forecast website that digitally tracks and compiles colour information from three major European cities: Paris, Milan and Antwerp. 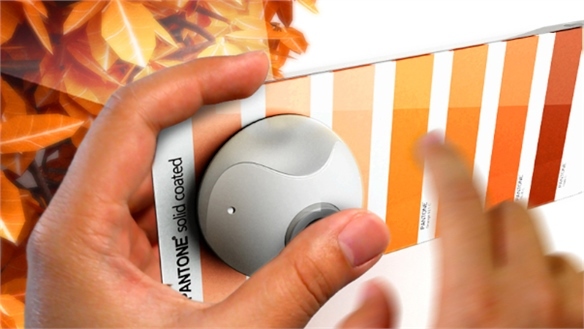 Color Elite Prototype Color Elite Prototype Taiwanese design student Chen Liao-Hsun has developed a concept for a portable colour scanner and swatch library. 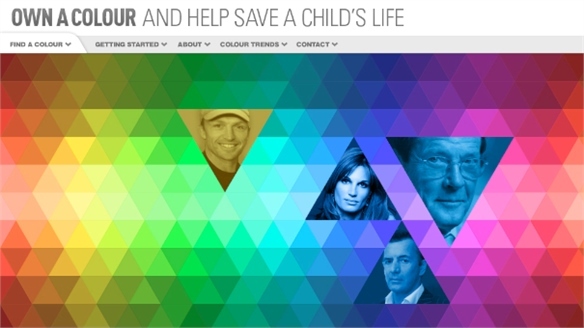 Own A Colour Own A Colour Paint manufacturer Dulux has teamed up with children’s charity Unicef to launch Own A Colour – a website that allows users to own a colour by donating a minimum sum of £1 to the charity. 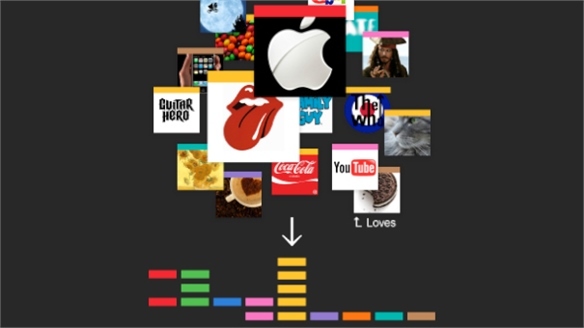 ColourDNA Pairs Interests with Hues ColourDNA Global online network colourDNA aims to connect people and their interests through the use of colour. Cinemetrics Mesaures Colour in Films Cinemetrics: Colour in Films Recent graphic design graduate from the Royal Academy of Art, the Hague, Frederic Brodbeck’s Cinemetrics project measures the colours used in films, creating unique portraits of cinematic masterpieces based on hue. 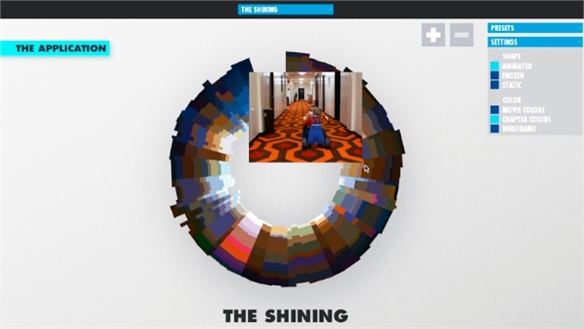 Colour as Information: Infographics Colour as Information: Infographics A rise in the use of infographics in modern media communications demonstrates the functional role of colour beyond decoration. 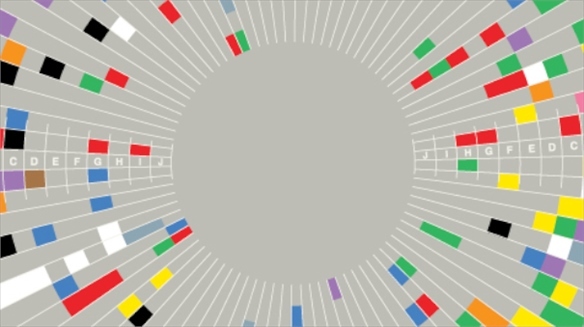 From the data charts illustrating world news and events to the stylish depictions of everyday quantities, colour is being used to translate statistical information into more engaging formats. Stylus looks at the onset of a new tonal language. 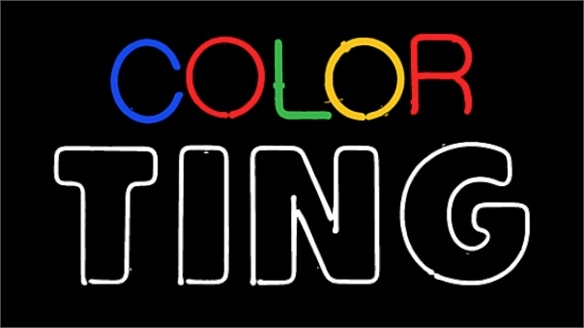 Colour Naming: Berlin & Kay Colour Naming: Berlin & Kay Colour is increasingly used as a method of filtering information, with image search engines such as Google Images and online shopping platforms, including net-a-porter.com, allowing users to screen search results by hue. The common colour terms in use today are mainly based on the system devised by American anthropologists Brent Berlin and Paul Kay. Stylus revisits their seminal text Basic Color Terms: Their Universality and Evolution, published in 1969. By combining Berlin and Kay’s simplified colour identification with the extensive resources that exist on the internet, newly developed software opens doors onto a world of varied colour inspiration.